A Kindle in Hong Kong: Happy Mid-Autumn Festival! It's Mid-Autumn Festival in Hong Kong, the season of fire dragons, moon cakes, and the first hints of fall. What are you doing to celebrate? I'll be enjoying a relaxed weekend with my husband and going to see another fire dragon! The fire dragon trundled toward me through the crowded street. Smoke curled from the incense sticks protruding from its long, thin body like thousands of spines on some mystical porcupine. Sweat poured down the face and back of every spectator. The fire dragon wound back and forth through the streets, faster and faster, dancing to the beat of drums. A wave of cheers rippled through the crowd each time it came near. The drums rattled the high-rises, the dragon danced, and the pavement shuddered under our feet. This was the Mid-Autumn Festival in Hong Kong, a time to celebrate the moon goddess and her flight across the sky. My flight wasn’t like that of Chang’e, the goddess who escaped her lover in a blaze of luminescence. I was flying toward mine. His gravitational field had pulled me across the sea, drawn me to a distant isle of fire dragons and skyscrapers. I’d follow him anywhere—even to Hong Kong. We hadn’t lived in the same country since we’d met, but this was our chance to be together, to build a life in the city where he grew up. But one month ago, his company sent him to London. I first met Ben in London, at a fencing club. I was a bookish American student on a semester abroad. He was an opportunity for a real live English romance, my very own Mr. Darcy, except that unlike Darcy, Ben was talkative—and half Chinese. I’d taken up fencing several years before, attracted by the romance of sword fighting and the fact that it was something unique, historic, literary even. I wasn’t bad, and the sport brought me unexpected confidence. It seemed like a great way for an introvert like me to connect with people at the university in London. When I pushed open the door to the club, the familiar buzz of the scoring machine and the squeak of athletic shoes on the floor reached my ears. I rocked on the sides of my feet, unsure how to join in. Ben came over immediately, introduced himself, and invited me to fence him. I was relieved at being included and already curious about this open-faced young man whose accent I couldn’t place. He won our first bout by one point; he always said I wouldn’t have dated him if I had been able to beat him. We fenced a few more bouts, and then sat cross-legged in our matching gear, masks forgotten on the floor. He prodded at my shy shell; he asked me questions, joked about fencing, told me he was from Hong Kong. He had an eloquent vocabulary mixed with an offbeat sense of humor. He didn’t seem to mind when people didn’t get his jokes. He put me at ease, and I found myself stealing glances at him as I adjusted my equipment and met the other fencers. By the time I changed my shoes and left the gym, I was already lecturing myself about reading too much into his attention. I didn’t want to get swept away, blinded by the novelty of an international fling. But it was too late. For two months, we wandered the streets of London together, kissed on street corners, and took spontaneous trips to Oxford and the coast. He took the time to get to know me, using our shared love of fencing to get me talking. He surprised me with his insight, his persistence. He seemed to understand why I, analytical and introverted, never quite fit into any group. As someone who had grown up shuttling between Hong Kong and London, not quite Chinese and not quite British, he knew what it was like to be an outsider. Ben had a gift for coaxing people to confide in him and trust him. Before long, he got even the most reserved, responsible American girl to give him handfuls of her heart. “I’ll get a job wherever you live after graduation,” I told him. Our confidence in each other was reckless and optimistic, but staying together felt like the only sensible thing to do. In 2010, thoroughly in love, I moved to Hong Kong to be with him. It lasted for one glorious month. Ben left me in Hong Kong on the eve of the Mid-Autumn Festival. Instead of exploring the city with him, I was at the airport saying my goodbyes while the children of Hong Kong flooded the streets and parks with lanterns. Instead of walking beneath the Mid-Autumn moon together, we shared a fierce hug and made a hundred tiny promises. The next day, still reeling from the sheer solitude, I found my way to Tai Hang—to the incense and the drums. The fire dragon loomed, full of possibilities. It had already grown dark, or as dark as it ever gets in the city, when I emerged from the subway into a night that felt nothing like the end of September. The humidity surrounded me like steam pouring out of a broken dumpling. I made my way along the street. An arch announced the festival in gold foil and tissue paper fringe. I found a spot beside a Chinese family of three or four generations. A group of Mainland girls chattered in shrill Mandarin in front of me. The balconies of a hundred apartments teetered over our heads. I hadn’t had a chance to ask Ben what the fire dragon would be like before the airport security line swallowed him and carried him away. The fire dragon in my mind looked like a dancing, tuft-eared Pekinese dog, with people standing under a big sheet to form the body, holding up the head. Of course, that’s an image from a lion dance, not a dragon dance, I would soon learn. I was just starting to discover that Hong Kong was full of surprises—and I was ill prepared. I jumped up on my toes and looked for the Pekinese head. The drums began. “Want me to hoist you up?” An American man stepped close behind me. He was tall, and the scent of stale beer mixed with the incense. “You sure? You want a good view when they bring out the dragon,” he reached for my arms. “I can see just fine.” I maneuvered away from the man, finding refuge on the other side of the Chinese family. My fingers curled tighter around my purse. Suddenly, I was aware just how alone I was in the crowd, and in the country. “Why didn’t you just go to London instead of Hong Kong when you found out Ben would be leaving?” my friends had asked me. “You’re already moving across the world for him.” I wondered the same thing myself—now. But this was 2010. I wasn’t in a position to jet around the world after men lightly. I’d graduated from Colgate University with US$70,000 in student debt, debt I had taken on before the economy crumbled. Moving without a job was not an option. Employment would be hard to find in London for an English major with limited work experience and no visa. I didn’t have a chance. Jobs were not easy to come by anywhere in the Western world. My generation faced the worst job market in living memory. My college educated friends competed tooth-and-nail for part-time barista work, borrowed more money for graduate school, and moved in with their parents. There was a mounting sense of desperation among those of us who had taken out big student loans only to discover there was no work for us in our own country when we graduated. There were rumors going around that this was where the jobs were to be found. Ben had found work in Hong Kong, his hometown. My own sister had recently begun teaching English in South Korea. So, I spent nearly a year applying and interviewing for a job in Hong Kong (and yes, living with my parents while I did it). When a local school emailed and asked me to be their new English teacher, it seemed the long distance part of our international romance, which had lasted two and a half years by now, was finally done. I showed up with a work visa and a salary advance, ready to take on the city and the next stage in our relationship. Yet here I was, alone in a crowd as the fire dragon approached. I couldn’t afford to give up my new job when Ben’s circumstances changed. With a one-way ticket and a monthly student loan payment of US$935, I stayed in Hong Kong. The drums pounded. A row of children appeared, carrying lanterns that bobbed above the crowds. Their glow mixed with the lights from the apartment buildings looming over our heads. My arms brushed an elbow on one side, a woman’s handbag on the other. Of course, the other thing people asked was, “What if you don’t get along when you finally do live in the same country?” That was a question I couldn’t answer. As I stood in the Mid-Autumn crowd, little did I know that my move to Hong Kong would bring about our longest separation ever, a separation that would bring me face to face with the reality of the risk I had taken. The pounding of the drums intensified. The people around me drew closer together, choking what little breeze there was. Finally, the fire dragon appeared, followed by more children carrying lanterns. I was surprised when I saw what it was really like. It had an elaborate head, made from branches twisted into intricate shapes and filled with a thicket of incense. The thin body was over 200 feet long and muscular bearers danced beneath its undulating shape. The people around me cheered as the dragon’s head passed us and then turned back on itself, leaving behind a million tiny trails of smoke. I felt a growing sense of excitement as the fire dragon whirled and darted through the streets. Its wiry, crackling body defied my expectations. It was fast. It was wild. I pushed forward so I could see better. I was a part of the crowd. I didn’t feel like a foreign girl, alone, in an interrupted romance. This was an adventure! I could do this; I could live in Hong Kong, alone. Ben and I would be together soon enough. As the dragon twirled in front of me, I didn’t know that in nine months I’d be sitting on the floor of my single apartment, cell phone pressed to my ear, feeling the foreign ground shift beneath me, feeling a panic I’d been too confident to anticipate. I pulled my hair away from my neck, trying to find relief from the suffocating heat, too stubborn to guess at the coldness that was coming. This was not what I had planned. Nothing happened the way I expected. This was Hong Kong. As the rumble of the drums reached a crescendo, the men carrying the dragon pulled off the sticks of incense and passed them to the crowd. Within seconds, the fire dragon dispersed into a thousand tiny sparks in the night. 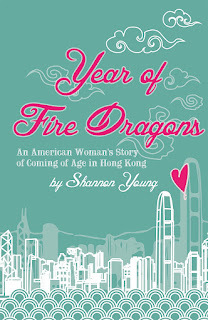 You can buy Year of Fire Dragons in Hong Kong bookstores, on Kindle, or anywhere else books are sold.